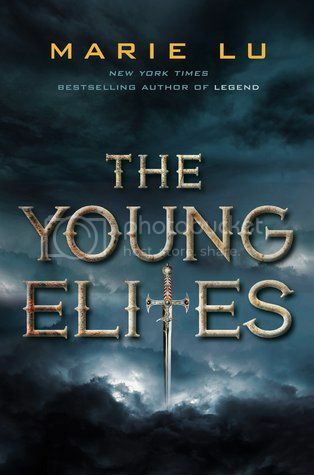 The Young Elites is the first book that I’ve read by Marie Lu, and now that I’ve been introduced to her awesomeness, I can’t wait to read more! I was super impressed by this book, and I’m kicking myself for not having read anything by Lu sooner. A decade has passed since a deadly illness crippled the nation, killing many and leaving some survivors with strange markings, and an even smaller few with special powers. The survivors are called malfetto. Adelina Amouteru is malfetto; her black hair and lashes turned silver, and she has a harsh scar in the place where her left eye once was. After being rescued by a group of Young Elites, who are a group of malfetto with special powers, Adelina comes to realize that she’s not just a normal malfetto girl, but something different entirely. The characters in the novel were all super interesting, especially the main character, Adelina. I had to sympathize with her for everything that she had been through in her short life. Though she battles throughout the novel with feelings of insecurity, put in her mind by her abusive father, she is still one of those strong heroines that I really enjoy. But while she is a badass, we see another side of her throughout the book as well, a side of her that wants nothing more than to be loved and wanted. She was a really interesting character, and I’m curious to go on another adventure with her in the next book in the series. The secondary characters in the novel are very well written as well. There are some characters that you’re really going to fall in love with, and some that you’re not going to love so much. The storyline for the book was extremely creative and unique. I had seen the book described as X-Men meets Assassin’s Creed 2 meets Game of Thrones, and that description is very much accurate. I loved that each of the characters had different sorts of powers and used them all in different ways. I also enjoyed the world-building in the book, as it was very well described and I could picture it perfectly in my mind. The book ends with a cliffhanger, not a massive one, but enough to leave me pining for the next book. I’m super curious to see where Lu is going to go with this story in the rest of the series. Also, I urge you to check out Marie Lu’s Pinterest account, which has some really awesome photos and artwork that were her inspiration for the story! Overall; The Young Elites is an excellent beginning to what will likely be a really fantastic series. I can’t wait to get my hands on the next book in the series! So glad you liked this. I have an ARC too and plan to read it after the book I'm reading now. You should read Marie's first series. It's awesome. Creative, unique, interesting characters...ah, I'm so excited for this book! "Extremely creative and unique" seems hard to come by in teen fiction lately where so many books appear derivative. I am glad that The Young Elites proves to be something different and that you enjoyed it. I am looking forward to picking it up soon. Thanks for your review!